These automatic impulse sealers and constant heat automatic sealers meet a wide variety of heat sealing needs. 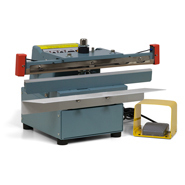 Depending on the machine, you can seal poly tubing and poly bags, laminate bags and foil bags in 12", 18", and 24" sealing widths (8" and 32" sealing widths available for some models). 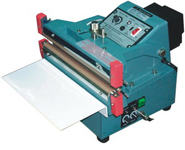 These automatic heat sealers are designed for industrial bag sealing use. Our Impulse bag sealers form a secure 2mm, 5mm, or 10mm wide seal on polyethylene and polypropylene up to 6 mil, 8 mil or 20 mil thickness.